Jesse Garcia’s LGBT activist cred runs long and deep. In 2000, he joined the Stonewall Democrats of Dallas. He was on the board of National Stonewall Democrats (2006-2008) and is a former secretary of the Gertrude Stein Democrats. He also started the first LGBT LULAC (League of United Latin-American Citizens) council (the Dallas Rainbow Council) in 2006, which worked on both LGBT and Latinx issues. 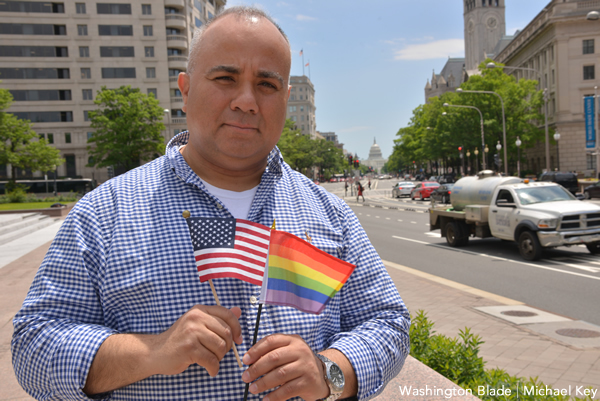 Garcia is now president of the gay LULAC council in Washington, which he helped launch in 2014. That group is hosting two free workshops on citizenship (June 16 and 19) at the Marvin Center (800 21st St., N.W.) at George Washington University (details at lulaclambda.org). Garcia also has his own weekly podcast “The Jesse Garcia Show,” which features LGBT Latinx folks “who are doing amazing things” in politics, culture and art. He followed that working in Dallas as a special assistant for the Administration for Children and Families from 2008-2011. For his efforts, Garcia has been named one of this year’s Capital Pride Heroes along with Gregory A. Cendana, Patrick Grady, Jorge Hernandez and Samantha Master. Karen Kendra Holmes and Linda Roberts get this year’s Engendered Spirit Awards. The gala is Thursday, June 7 at 880 P (880 P St., N.W.). Tickets are $75. Full details at capitalpride.org. Garcia works by day as a writer/editor for the Department of Commerce. He came to Washington in 2011 for a presidential appointment. He’s single and lives in Shaw. Garcia enjoys kickball, volunteering and podcasting in his free time. I’ve been out since 1991. My mother was the hardest to come out to. I had to wait a whole decade to eventually tell her. One day she asked me for a computer with internet access. I had to book a ticket and fly down to tell her before she Googled my name and saw that I was a big gay activist who lived nine hours away from her. Cleve Jones. He advocated for LGBTQ and AIDS causes. He now works with unions and helps Latinx immigrants with labor issues. Town Danceboutique. Thank you for the awesome memories! Being Ricky Martin’s third and final husband. All my issues are LGBT issues. Reproductive rights, immigration rights, gun violence, poverty, hunger, voting rights and the environment. The AIDS epidemic. We lost so many kind souls, smart people and forward thinkers. If the spread of this disease had been prevented early on, I strongly believe our nation would have been a nicer, more tolerant place by now. Our civil rights movement would have been further along. Madonna. Her female empowerment, sexual positivity, ambition, and embracing of LGBTQ culture provide me so many cues on how to be a badass. Her iconic music, especially her “Truth or Dare” documentary showing openly gay dancers being creative, handsome and smart, came out during an important time of my life. I had never seen positive images of gay people before. It allowed me to believe that there was a future for me being gay. I would welcome all the new gay folks into our family. I don’t. You got one life. Make the most of it. We all have a place in the movement. 1. Work with each other and don’t try to undermine each other. 2. Check your egos at the door. So many people are depending on you. 3. Use your powers for good. My mother and sister’s health. Not necessarily an LGBT movie, but it really moved me because one of its characters. “I Like It Like That” came out in 1994 about the struggles of a Puerto Rican family in the Bronx. It had a beautiful performance by supporting cast member Jesse Borrego who played Alexis, the transgender sister that dominates each scene. Be prepared to laugh and cry. Stonewall Kickball Championship. Come on Ball Busters! All the worrying, late night studying, holding down multiple part-time jobs, trusting your gut instinct and doing the right thing will eventually pay off. I love my country, working for the cause, politics and learning more about our history. Of course, I would end up here.